In this tutorial, you’ll learn how to transform your web app to a Helm chart, which can be deployed on IBM Cloud Private(ICP) and/or also on a private cluster. Note: We are not going to bind any Watson services here since it is a private cloud, which is hosted on premises and not on a public IBM cluster. Therefore, if you want to integrate any IBM Cloud service, you need to do that by using the conventional API call mechanism. For reference, you can look at my GitHub repo. Alternatively, you can bind the services to your cluster by using these steps and updating the deployment.yaml accordingly. Install Docker in your dev environment and create an account in Docker. You must have a private cluster, either through IBM Cloud Private or on a Public IBM Cluster. If you are new to ICP, then you need to first complete this short exercise to get familiar with ICP. 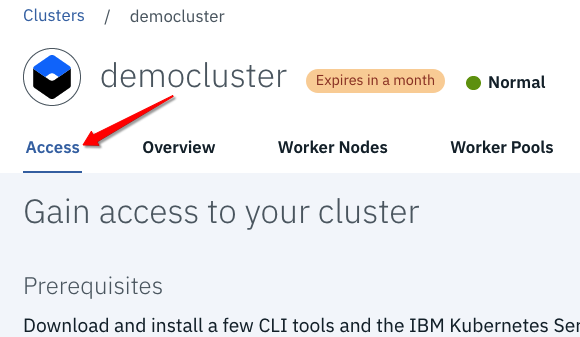 Or you can navigate to your IBM Cloud dashboard > Containers > Create cluster. Go through this tutorial to set up your CLI and to create a private cluster. After this step, you will have kubectl and bx commands configured. 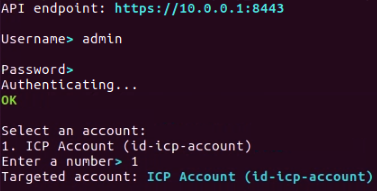 (Note: This step is only for ICP users) Log in to your ICP dashboard and navigate to Command Line Tools > Cloud Private CLI. Download and install bx pr command. Completing this tutorial should take about 20-30 minutes. First create your web-app and create the Docker file in the same directory. 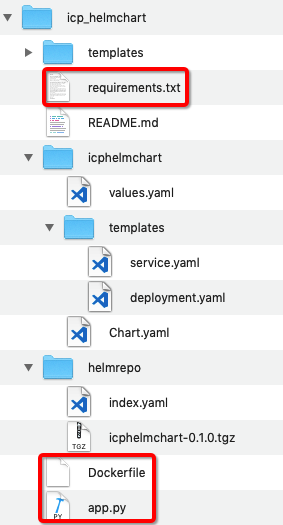 For example, please check the icp_helmchart directory in my GitHub repo, which contains the Dockerfile and application-dependent contents. Here, app.py runs a simple Flask-based web-app with the port as 6111. Build the Docker image and push it to your public or private Docker repository; it should be pulled without any issues. To build the Docker image, check out my GitHub repo. Then execute the command: docker image build -t <docker_username>/<docker-image-name>:<docker-image-tag>. In this case, I named my app arprasto/userinfoicphelmchart:v1. Next, push your locally built Docker image to the cloud by using docker push <docker_username>/<docker-image-name>:<tag>. service.nodeport: 31000 This port will be exposed to svc to navigate your app home page through a web browser. Note: service.internalPort and service.externalPort should be similar to the port specified in app.py. See how they are related and co-dependent here! [debug] Original chart version: ""
Navigate to Resource List > Kubernetes Clusters and click on your newly created cluster**. There will be instructions on this Access page, such as downloading CLI tools and other items that you need to follow and execute. Run ibmcloud cs clusters to make sure that you have successfully connected to your private cluster. Make sure to keep note of your <cluster-name>. 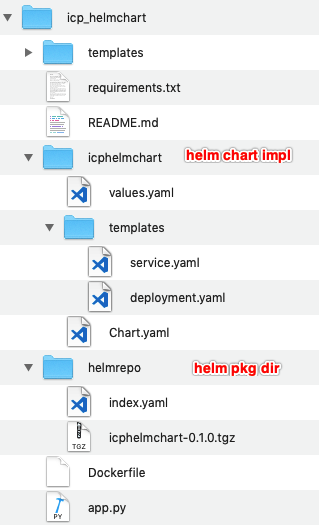 Open the icp_helmchart directory and run helm install icphelmchart. This will install your helmchart into your cluster. To check the running status of your helmchart, run kubectl get all|grep icphelmchart. If your pod is not in a running state, check the root cause of it by running kubectl --tail=1000 logs <pod-id>. For example, in the above screenshot we can see the logs by running kubectl --tail=1000 logs icphelmchart-7b8dcd9685-p628p. Run ibmcloud cs workers <cluster-name> to check the public and private IP addresses of your cluster. Now go to your web browser and navigate to your web-app home page: http://: Note: If you have not changed the nodeport, than you can use 31000 as the nodeport. cd icp_helmchart and then helm package icphelmchart. This will build a <helm-name>.tgz file. Before the next step, publish your GitHub repo where you want to push your helm chart. Publish your git repository by using this guide. In my case, the published directory is https://arprasto.github.io/icp_helmchart/helmrepo/. This will generate an index.yaml file inside your helmrepo/ directory. Push your above changes to GitHub. Now to add your own helm dir to ICP, log in to the ICP dashboard. Navigate to Manage > Helm Repositories > Add Repository. Then give a name to your directory and the published repo URL and add it. Navigate to Catalog > helm chart. This is where you’ll see your helm chart published. Follow the steps below to deploy your new helm chart into ICP through shell prompts. bx pr clusters, which will show the . Update your helm repo to sync it with your ICP account by using helm repo update. Now search to check if you can see your helm chart in the local helm repo by using helm search <helm-chart-name>. At this point you should be able to see your helmchart listed. If not, please resync or check if your changes checked into Git. You can now install your helm chart into your ICP cluster by using helm install <helm-chart-name>. From this tutorial, we just saw how to convert your web-app to helm chart and how to deploy that in IBM public or private cloud. This is also another way to convert your conventional web app to a microservice. I encourage you to continue experimenting with Helm charts and building on IBM Cloud for free. Enable autoscaling in your Kubernetes cluster and configure an app to automatically scale up or down based on CPU utilization.